I am very picky when it comes to software used by my company. I did a lot of research to see which Call Recording software would be a perfect fit for my marketing corporation. Finally, I came across Phonewagon and they really did their job! I use this software for my of my clients and I love working with them. customer service agent is very helpful; he reaches all my demands and helps with coding or any troubleshooting I may have. (which are none) since PhoneWagon works perfectly. The recording system is very good quality and very easy to use! I love it. I would definitely recommend this product to anyone trying to track conversions! This is the way to go. I am very picky when it comes to software used by my company. I did a lot of research to see which Call Recording software would be a perfect fit for my marketing corporation. Finally, I came across Phonewagon and they really did their job! I use this software for my of my clients and I love working with them. customer service agent is very helpful; he reaches all my demands and helps with coding or any troubleshooting I may have. (which are none) since PhoneWagon works perfectly. The recording system is very good quality and very easy to use! I love it. I would definitely recommend this product to anyone trying to track conversions! This is the way to go. 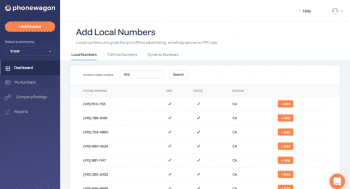 How easy it is create a new, localized number for each campaign. Also, the AdWords and Google Analytics integrations can be done in less than 5 minutes. Very straightforward and easy. How easy it is create a new, localized number for each campaign. Also, the AdWords and Google Analytics integrations can be done in less than 5 minutes. So easy to use, cost effective, great customer service….can’t beat it! I love that my clients are now able to put some hard statistics on the success we are having for them…I love it and they love it. Phonewagon is great! I will recommend to everyone! So easy to use, cost effective, great customer service….can’t beat it! I love that my clients are now able to put some hard statistics on the success we are having for them…I love it and they love it. Phonewagon is great! I will recommend to everyone! The design is beautiful and everything makes sense. I like that even my office manager is able to use it without asking any questions (and that says a lot!). All the features are there – dynamic numbers, multiple users and client logins with different permission levels, robust reporting, etc. And they allow you to use true 800-numbers unlike a lot of the other call tracking systems out there. We started using PhoneWagon because we needed to track phone leads in addition to web leads. We quickly realized we were generating a lot more leads for our clients than we thought since we weren’t tracking phone calls. We were able to begin using PhoneWagon in less than 5 minutes and had our first number configured in about 30 seconds. Everything is where it’s supposed to be. They even have logins for my clients which is nice so I don’t have to manually send them reports or pull a call for them if they have a question about something. I can’t see us ever using anything else to track phone calls. Give it a shot. I have never had to wait more than 4 minutes for a question to be answered. Ryan seems to always be online and willing to help out. The design is beautiful and everything makes sense. I like that even my office manager is able to use it without asking any questions (and that says a lot!). All the features are there – dynamic numbers, multiple users and client logins with different permission levels, robust reporting, etc. And they allow you to use true 800-numbers unlike a lot of the other call tracking systems out there. We started using PhoneWagon because we needed to track phone leads in addition to web leads. We quickly realized we were generating a lot more leads for our clients than we thought since we weren’t tracking phone calls. We were able to begin using PhoneWagon in less than 5 minutes and had our first number configured in about 30 seconds. Everything is where it’s supposed to be. They even have logins for my clients which is nice so I don’t have to manually send them reports or pull a call for them if they have a question about something. I can’t see us ever using anything else to track phone calls. Give it a shot. I have never had to wait more than 4 minutes for a question to be answered. Ryan seems to always be online and willing to help out. The PhoneWagon software allows us to seamlessly track phone calls for our clients and has resulted in making sure the campaigns are being run correctly. The ability to look at the reports and segment different calls is very helpful to understand the traffic source for each phone call. We like how customers can login to the software and we can give the client different levels of access. Also this team cares about it’s clients and is helpful in any way possible! I honestly can say I don’t have any negative things to say about their software or company…I have nothing but a good experience. 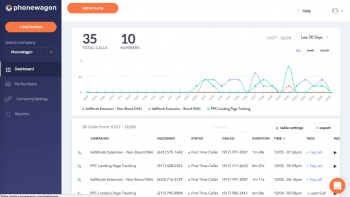 The PhoneWagon software allows us to seamlessly track phone calls for our clients and has resulted in making sure the campaigns are being run correctly. The ability to look at the reports and segment different calls is very helpful to understand the traffic source for each phone call. We like how customers can login to the software and we can give the client different levels of access. Also this team cares about it’s clients and is helpful in any way possible! I honestly can say I don’t have any negative things to say about their software or company…I have nothing but a good experience. Based in New York City, PhoneWagon is an interesting player in the Call Tracking Software market. In fact, PhoneWagon was only founded in January of 2017, but they have managed to make a splash in such a short period of time. The provider is still within its start up phase, but has managed to raise around $1.2 million in seed funding. 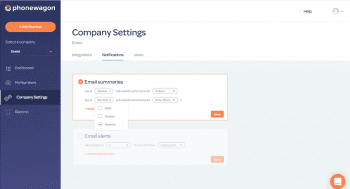 PhoneWagon differs from competitors in the field by offering a service best suited towards the SMB market, with an incredibly simple to setup, and use — yet powerful — call tracking solution. 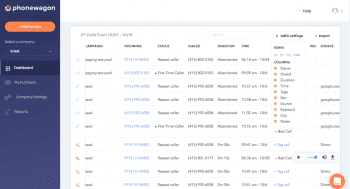 PhoneWagon goes above and beyond phone tracking by also allowing businesses to interact with clients through text messages, both automated and manually sent. Like most cloud providers, PhoneWagon offers their service with three different pricing tiers. But what is a bit different is that pricing simply changes the amount of phone numbers and sometimes minutes included, while all features are available with all plans. This provides your business with the option to choose the plan that best fits both the business’ budget and needs. What’s more unique about PhoneWagon’s services is that they offer their solution on both standard and unlimited plans. Lets take a closer look. What is truly unique about PhoneWagon’s solution is that every single feature is included in every single plan, even for the most basic starter plans. Instead of locking features to more expensive tiers, PhoneWagon simply differentiates their plans based on the amount of provided phone numbers, and minutes available for their limited plans. But we wanted to go ahead and highlight exactly what features your business does gain access to with PhoneWagon’s services. PhoneWagon represents the future of Call Tracking Software solutions in the way their services differ from the old school, existing providers. Founder Ryan Shank explains that existing providers in the market were offering costly, difficult to set-up, and overall clunky solutions that were mostly restricted to larger Enterprise businesses. With PhoneWagon, Shank wanted to develop and design an simple solution, with an incredibly simple user experience in order to enable even the smallest teams to take full control over their marketing expenses. But beyond making the platform more accessible, PhoneWagon goes above and beyond by offering features generally unseen from other solutions on the market. For example, PhoneWagon offers text message automation, sending a direct follow up text-message to potential clients once they are off the phone with an agent. The idea is that you will re-engage the caller before they have the chance to contact another business. Agents can also establish their own rules to automate phone outbound phone calls and to automatically respond to any missed calls and voicemails. 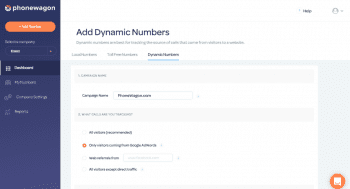 But PhoneWagon also contains the features a business would expect from a Call Tracking Software solution, including the incredibly important Call Recording, local and toll-free numbers, advanced reporting, dynamic phone numbers, keyword tracking, and Google AdWords integrations. But once again, going above and beyond, features like international phone numbers, whisper messages to agents, custom greeting messages and custom call-tagging expand the platform with functionality that isn’t exactly standard in this market. What Do You Think of PhoneWagon?